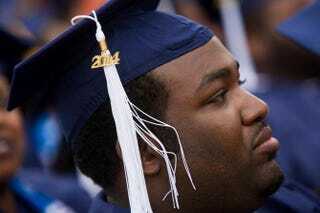 A graduate at Howard University’s 146th commencement exercises on May 10, 2014, in Washington, D.C. I have no idea who spoke during my college-graduation ceremony or what she (I think it was a woman) said. Chances are she talked about passion, service to others, following your dream, learning from failure, changing the world, fears, opportunity, blah, blah, blah. Commencement speeches often follow these worthy themes. T.J. Holmes is a journalist and TV personality. Formerly of CNN, he can currently be found at MSNBC, and his commentary can be found online. Follow him on Twitter.